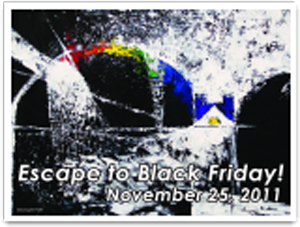 On Friday, November 25, as you are waking up out of your turkey stupor, and not sure what to do with your out of town relatives, plan a day of relaxing among beautiful artwork, instead of driving around parking lots for hours and standing in long lines, just to purchase hum drum gifts. Come to The Workhouse Arts Center for a full day of shopping. Artists will be on hand to talk about their work and assist in selections. Drinks and light snacks will be available for purchase. There are family friendly activities as well, so everyone is invited! We have a variety of activities for the whole family. The fun starts in my building, #9, at 9am! We open a full two hours earlier than the rest of the complex for the early birds out there. Then move a few doors down to the Glass Hot Shop for demonstrations. There will be an all day food drive in Building 4, as well as pictures with Santa from 11am-3pm in Building 3. The wonderful day will end at with a tree lighting ceremony at 5pm in the quad, followed by the opening reception for The Art of Fiber exhibit in Building 16. The complete list is on The Workhouse website. PLUS, I'm sure there will be some impromptu surprises that will pop up. Come early and stay all day! Green Tip~ Rent a Christmas Tree! Sadly, most of the folks reading this will not be able to do that. Like many great eco ideas, this one started on the 'left coast'. Companies in the Portland, OR and San Francisco areas can rent potted christmas trees, only for the length of the season. They are no cut down to die, nor made from petroleum based plastics. Perhaps by this time next year, someone in your area will be offering this service! 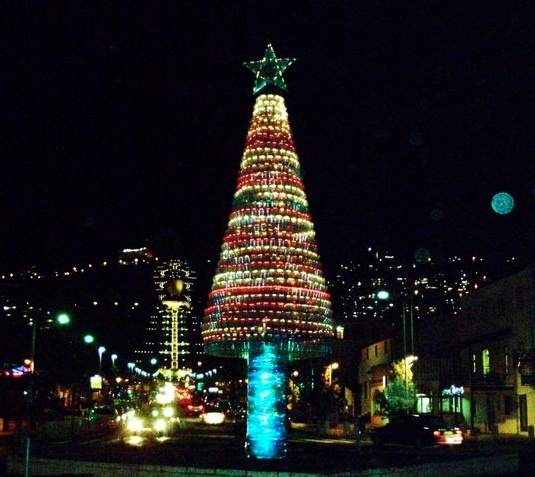 OR, you could make your own recycled christmas tree, like this one by artist Hadas Itzcovitch, installed in the city of Haifa, Israel. Click here to learn more about this tree.